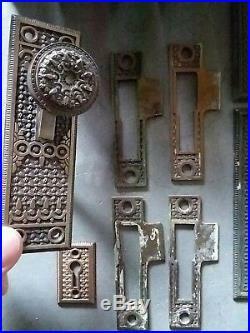 Large Antique Door Hardware Lot - 80 Pieces. A large lot of Reading Hardware Companies (RHC) "Elaine" door hardware. 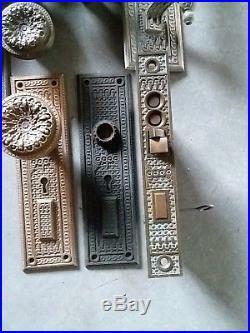 These are all original antique door hardware from the late 1800s. RHC began this design in 1889. Blumin classification D - 12400. This popular pattern is well made. It has a concave center. The design patent is # D19,272, Oct. 20, 1889 by John E. The knob was manufactured by Reading Hardware. 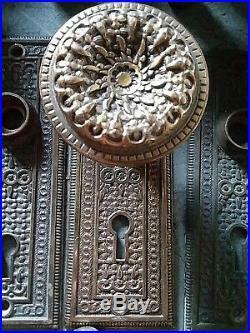 The plates, knobs, striker plates, key hole escutcheon, mortise lock face, large store pull and door bell pull are all made of brass/bronze (magnet does not stick). Plates is solid cast, not pressed. These are all well made pieces with beautiful design and fine casting. 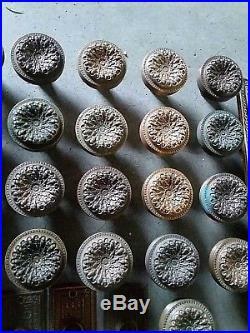 41 Passenger Door Knobs (nice condition, no dents or issues, minor oxidation on some). 17 Passenger Door Plates (some have some minor paint on the edges). 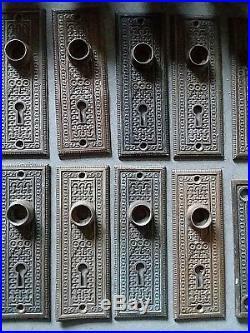 2 Entry Size Double Key Hole Plates that both retain original key hole covers. Covers are in good working condition. 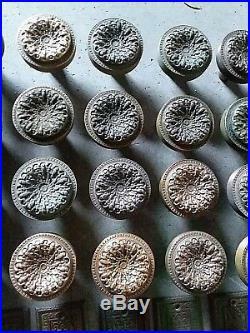 1 Larger Entry Size Door Knob (nice condition). Comes with working key (No damage everything works well). 1 Large Pull Missing Thumb Latch. 2 extra holes were drilled at some point on top 2 corners most likely to have plate sit flatter against the door. 1 5" X 5" hinge Moves freely. Pin does not come out. 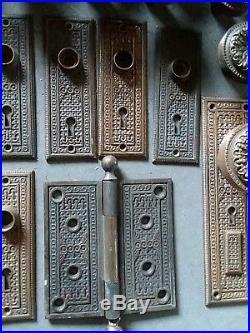 1 Escutcheon Key Hole Cover. 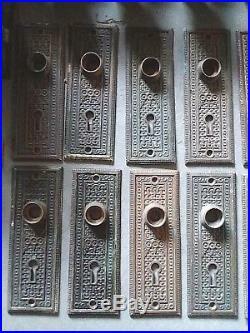 These are reversible with the pattern on both sides to allow mounting to either door jam. All are in working order and move freely. 1 is missing the dead bolt parts. 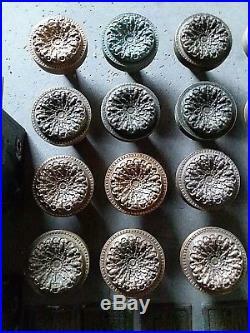 All of the cast iron bodies are in good shape with no cracks or breaks. (Some paint on a the faces). Pieces have not been cleaned. Patina vary between pieces with some having some oxidation. All condition issues are listed next to the pieces. 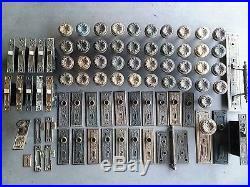 Nice large lot of useable hardware. Items will be well packaged. 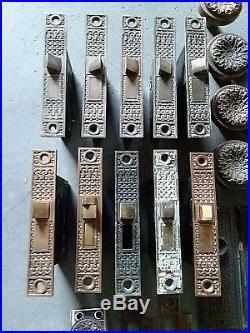 The item "Elaine Reading Hardware Large Lot Door Knobs, Plates, Locks Bell Pull 80 Pieces" is in sale since Wednesday, January 9, 2019. 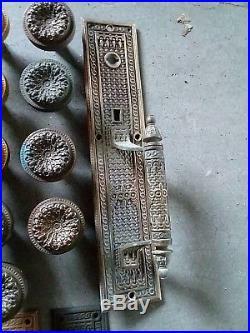 This item is in the category "Antiques\Architectural & Garden\Hardware\Door Knobs & Handles". The seller is "dennnick208" and is located in Pocatello, Idaho. This item can be shipped to United States.